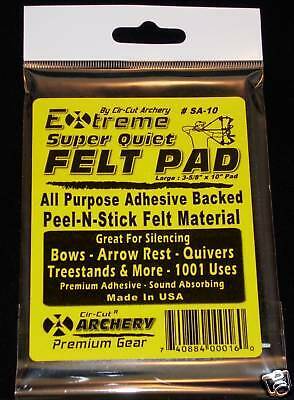 All Purpose Archery Felt Silencing Pad Super Quiet Extreme Felt, the original all purpose adhesive backed pad. Super sound absorbing & vibration reducing qualities, 1/16" thick with all weather adhesive. Great for bow sight windows , arrow shelf , quivers , limbs or anywhere a sound absorbing or vibration reducing material is needed. COLOR: BLACK, 1 pc. 3-5/8" x 10".